Hudson Garden Grill at NYBG | Bentel & Bentel Architects/Planners A.I.A. Nestled within the idyllic setting of the 40-acre Ross Conifer Arboretum, Hudson Garden Grill is the first full-service dining destination to open on the grounds of The New York Botanical Garden (NYBG). This restaurant spotlights the innovative flavors of New American cuisine as inspired by locally sourced, ethically produced ingredients from Hudson Valley farms and other regional producers. Providing an intimate yet airy sit-down dining space for NYBG visitors and the general public, the casual, contemporary rustic interior offers a true Garden experience, bringing a sense of natural beauty, refinement, and seasonality to each aspect of its design and culinary offerings. The rooms are characterized by accents of steel and oxidized copper that contrast with the whitewashed, rough-sawn red oak paneling reclaimed from Garden trees felled by Hurricane Sandy. Each element complements the architecture or the original building at its heart. 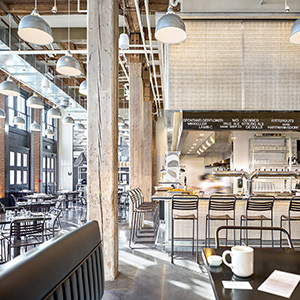 Low banquette seating, a solid walnut slab bar, and an open kitchen designed for exhibition cooking each contribute to the mood of conviviality, authenticity, and refreshment that the food and service exhibit in abundance.